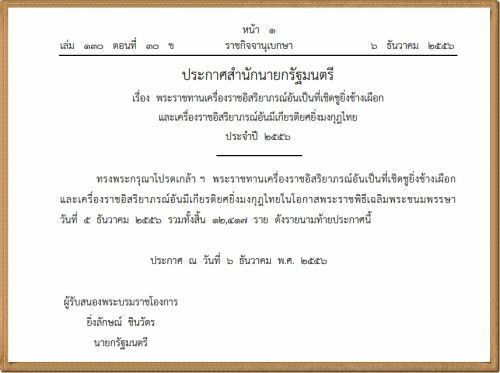 According to the Royal Thai Government Gazette on His Majesty King Bhumibol Adulyadej's birthday, December 5, 2013, the Office of the Prime Minister announced 12,417 recipients of the Royal Thai Decorations and Royal Thai Medals. Dr. Wongpakaran was nominated earlier to receive a royal decoration of the Knight Grand Cross (First Class) of the Most Noble Order of the Crown of Thailand (ประถมาภรณ์มงกุฎไทย, ป.ม.) from the King. 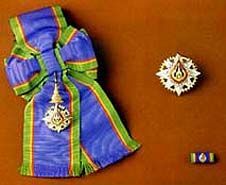 The ceremony for the presentation of the Royal Decoration which will be bestowed by the King representative to be held soon in Bangkok.